Fellow-Citizens: On this the birthday of the man most identified with the establishment of American independence, and beneath the monument erected to commemorate his heroic virtues and those of his compatriots, we have assembled to usher into existence the Permanent Government of the Confederate States. Through this instrumentality, under the favor of Divine Providence, we hope to perpetuate the principles of our revolutionary fathers. The day, the memory, and the purpose seem fitly associated. It is with mingled feelings of humility and pride that I appear to take, in the presence of the people and before high Heaven, the oath prescribed as a qualification for the exalted station to which the unanimous voice of the people has called me. Deeply sensible of all that is implied by this manifestation of the people’s confidence, I am yet more profoundly impressed by the vast responsibility of the office, and humbly feel my own unworthiness. The experiment instituted by our revolutionary fathers, of a voluntary Union of sovereign States for purposes specified in a solemn compact, had been perverted by those who, feeling power and forgetting right, were determined to respect no law but their own will. The Government had ceased to answer the ends for which it was ordained and established. To save ourselves from a revolution which, in its silent but rapid progress, was about to place us under the despotism of numbers, and to preserve in spirit, as well as in form, a system of government we believed to be peculiarly fitted to our condition, and full of promise for mankind, we determined to make a new association, composed of States homogeneous in interest, in policy, and in feeling. True to our traditions of peace and our love of justice, we sent commissioners to the United States to propose a fair and amicable settlement of all questions of public debt or property which might be in dispute. But the Government at Washington, denying our right to self-government, refused even to listen to any proposals for a peaceful separation. Nothing was then left to do but to prepare for war. The first year in our history has been the most eventful in the annals of this continent. A new Government has been established, and its machinery put in operation over an area exceeding seven hundred thousand square miles. The great principles upon which we have been willing to hazard everything that is dear to man have made conquests for us which could never have been achieved by the sword. Our Confederacy has grown from six to thirteen States; and Maryland, already united to us by hallowed memories and material interests, will, I believe, when able to speak with unstifled voice, connect her destiny with the South. Our people have rallied with unexampled unanimity to the support of the great principles of constitutional government, with firm resolve to perpetuate by arms the right which they could not peacefully secure. A million of men, it is estimated, are now standing in hostile array, and waging war along a frontier of thousands of miles. 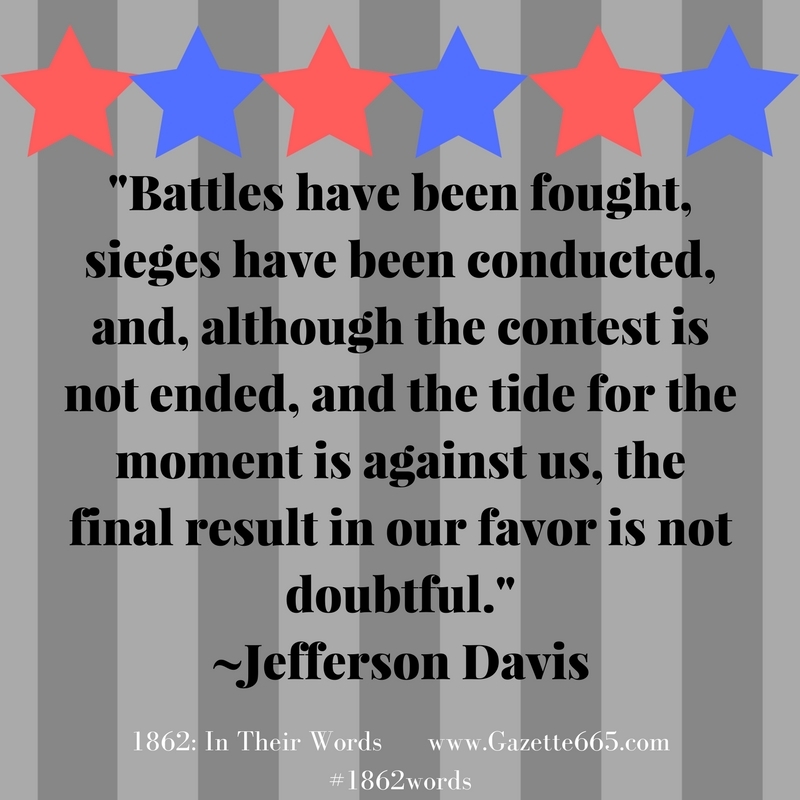 Battles have been fought, sieges have been conducted, and, although the contest is not ended, and the tide for the moment is against us, the final result in our favor is not doubtful. Wait, didn’t Jefferson Davis (President of the Confederacy) have an inauguration day in 1861? What is going on? Yes, Davis took a presidential oath of office and was the provisional president during 1861. Then the Confederacy had an election in November 1861, Davis won, and on February 22, 1862, became the official and elected president. The second inauguration took place in Richmond, Virginia. The Confederate Constitution gave the president a six year term, so Davis would have been president until 1868 (except the war and Confederacy ends in 1865). 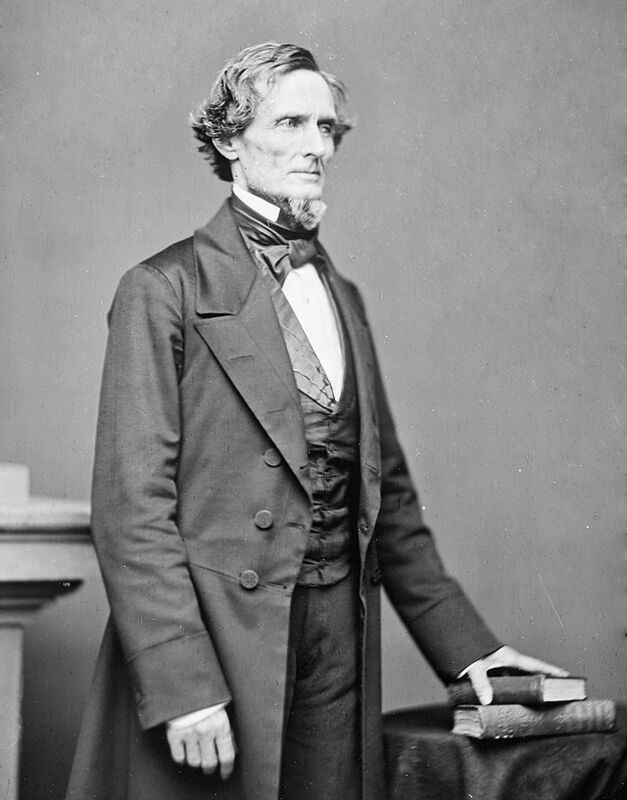 In his second inaugural address, Jefferson Davis reviewed the Confederacy’s accomplishments in the previous year and looked ahead to the future. He continued to justify the Southern war and pointed to attempts to negotiate with the Federal government, drawing parallels to Colonial attempts to talk with England during the American War For Independence. The Confederacy had managed to form a government and write a constitution (though they borrowed a lot of ideas from the U.S. Constitution). They had raised large armies. They were sending diplomatic messages to European powers, seeking support. Both North & South used George Washington’s memory for their patriotic causes. Interesting, the immediate future wasn’t extremely bright in February 1862. Forts Henry & Donelson had surrendered and Union generals had large armies assembled for further invasions. However, the Confederacy was confident they would get recognition and support from Europe, basing this opinion on “King Cotton diplomacy.” Davis pronounced his opinion that the Confederacy would win the war and become an independent nation. Davis mentions George Washington, and the “new” president’s inauguration was actually on Washington’s birthday. 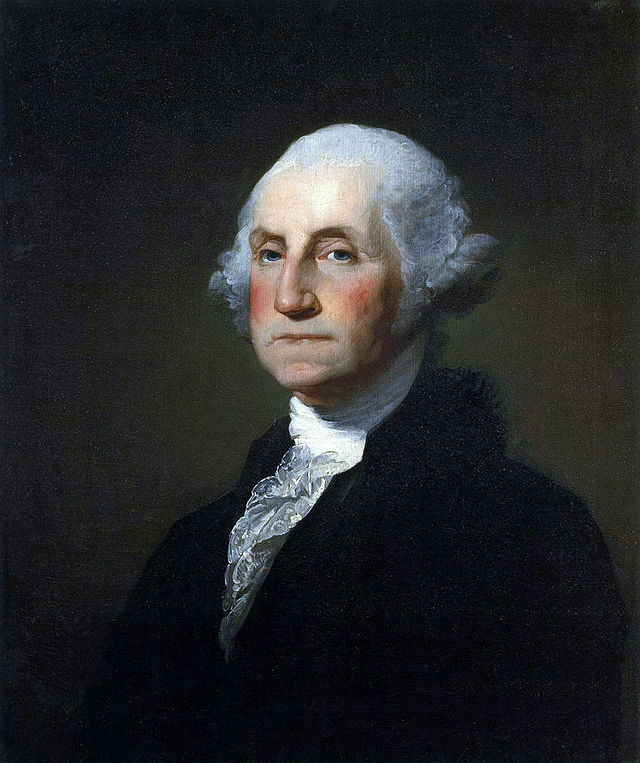 Both sides – Union and Confederate – used George Washington as a patriotic figurehead. And each had their own version of Washington and his attributes. The South tended to focus on Washington as a general, fighting for his homeland against the tyranny of the mother-country. The North often highlighted Washington as the “Father of the Country” – a united country. P.S. Do you find historical facts being used or twisted in modern media to support a cause?